There are so many creative ways to reach out to kids here at the Ranch. Creativity is a must with these kids because we live in a culture that is extremely skeptical of absolute truth. Well, absolute truth is at the forefront of the gospel. This gospel is what we, as believers, ground ourselves upon—it is our foundation, and we believe it with every fiber of our being. This gospel is the good news, it is the answer to the bad news: we are sinners separated from God, because God is perfectly holy and we are the opposite. The good news is that Jesus bridged that gap for us so we may be in communion with the Lord Most High again. Jesus, who knew no sin became sin and died in our place so we may become the righteousness of God. WHAT. Crazy awesome. We can be in fellowship with God because of what Jesus did on the cross. So, how to we share that crazy awesome news with a kid that has no idea what this is all about? There are many ways, but this one is one of my favorites. After me and my kid do a chore, they get to pick a treasure from the treasure chest. 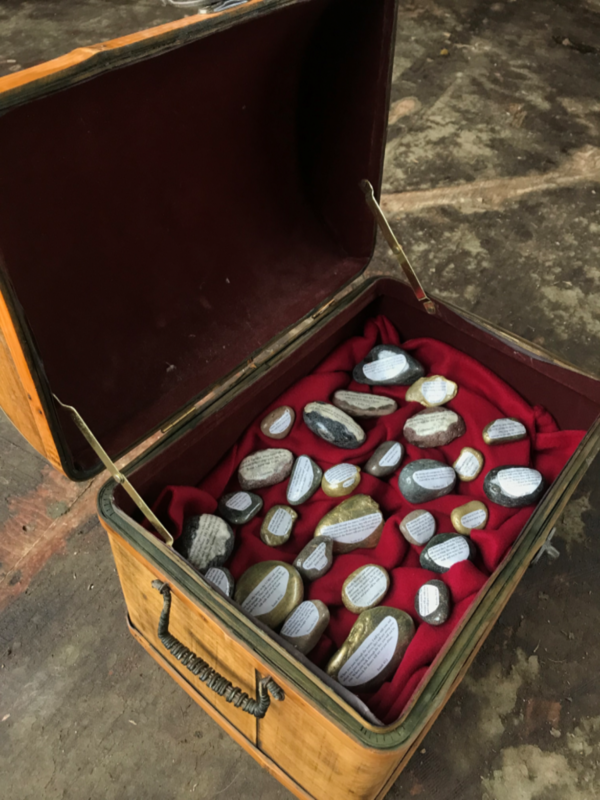 This treasure chest is filled with Verse Rocks—stones with printed bible verses on them. They are all shiny, pretty, and some are gold. Our kiddos, young and old, love small treasures like these. For the kid to be able to take their treasure home, we must fill out a verse study sheet together. The first question on this sheet is: What does this verse say in your own words? The second question is: What can I practice in my life based on what my verse says? Then we pray. That’s it. 1)This treasure is something they earned after a chore. Kids will value something more if they had to earn it. 2) The verse study questions are important for them to really think about the verse. 3) I personally made the Rocks that they are picking from; prayerfully discerning what scriptures may hit home for some of our kids. I normally pick scriptures that include God’s promises, the gospel, and love from the cross. Making these treasures are oh-so fun as well! Some kiddos find a favorite verse and make their own customized treasure. 4) Printed out bible verse—regular printer paper works fine. You’ll have to use really small font! 1) Now is the time to paint your rock if you’d like. I have painted some gold in the treasure chest so they look like gold nuggets. Personally, I like the natural look. 2) Now, coat your rock with Helmsman lacquer. I have to do one side first, let it dry, then flip it over and do the other side. 3) Brush a thin layer of lacquer in the back of your scripture—stick it on your rock! Sticking on the flat side works the best. 4) Brush a thin layer of lacquer over the top of your verse and let dry completely. Wah-laa! 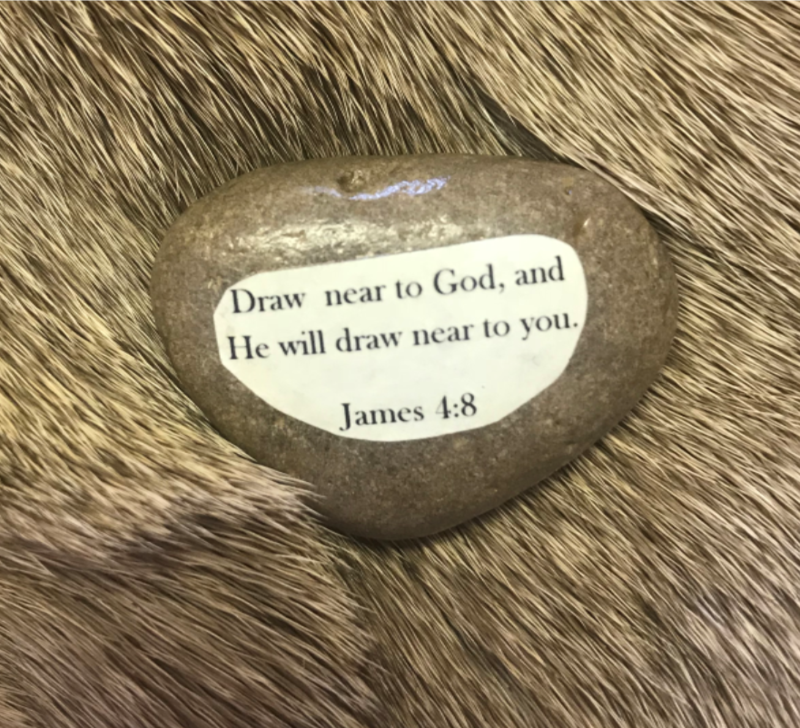 Your very own Verse Rock with your favorite scripture. Our boys at the ministry use them as pocket rocks; they carry their Verse Rock in their pocket all day, so they are reminded of God’s Word all day long.